A thermocouple is a junction of two dissimilar metals which generate a voltage proportional to the temperature of the junction (called seebeck effect). For many industrial heating processes, particularly those carried out at high temperatures, a thermocouple is the most accurate, convenient and simple method of temperature measurement. In some instances, it is the only feasible method. Kapton isolator , with or without SPC or NPC braid, PTFE/FEP jacket of prescribed standard colours, with or without S.S. over braid. Standard jacket colours- for type T-Brown, type J- Black and type K –Green. 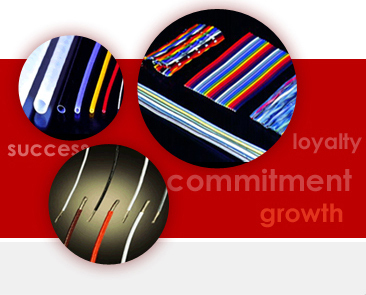 We offer different core and jacket colour, 14 / 0.2 mm conductors, parallel lay design, special tolerances and other types of thermocouples wires and customized construction for thermocouple cables. Contact us for additional information. 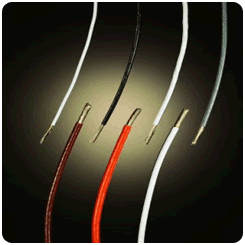 We make Class 1, class 2 and extension thermocouple cables. AWG 24/7/32 (0.2mm), SPC or NPC, Type E, PTFE/FEP insulated 0.2 mm RTI, two cores Red �?White, 3 cores Red- Red �?White, 4 cores Red- Red �?White �?White sequence, strain free planetary twisted, kapton isolator, SPC / NPC braid shield, specified colour PTFE jacket 0.25 mm RTI or more. Many combinations possible. The product referenced above represent the most popular constructions. Other constructions can be manufactured to meet individual specification and application requirements. Contact us for additional information. RTI means Radial Thickness of Insulation. Extension/Compensating cables are used for remote temperature measurements with thermocouples. They serve as an extension from the thermocouple to the measuring device. Thermocouple Extension cables must be of the same material as the thermocouples and compensating cables of material having the same thermo-electric characteristic as the thermocouple within the given temperature range. These can be offered with PTFE/FEP insulation.